The very mention of Hawaii conjures thoughts of swaying palm trees, spectacular azure surf meeting golden sandy beaches, hula dancers, and yes -- exotic tropical flowers! And rightly so, for Hawaii has an abundance of all. While visiting Hawaii for a time of rest and relaxation with my husband, I was enchanted with the beauty and variety of exotic tropical flowers, trees, and plants. We meandered through many fragrant botanical gardens on the lush island of Kaua'i, renown as the "Garden Isle." Our tour also included the beautiful islands of Oahu and Hawaii--the "Big Island." Again, visits to outstanding botanical gardens on each of these islands proved to be highlights of our trip. On this trip I also learned that the delicate yellow Hibiscus -- "Pua Aloalo" in the Hawaiian language -- is Hawaii's official state flower. Having heard much about exotic Hawaiian orchids all my life, I was amazed to learn that Hawaii's official state flower was NOT the orchid. 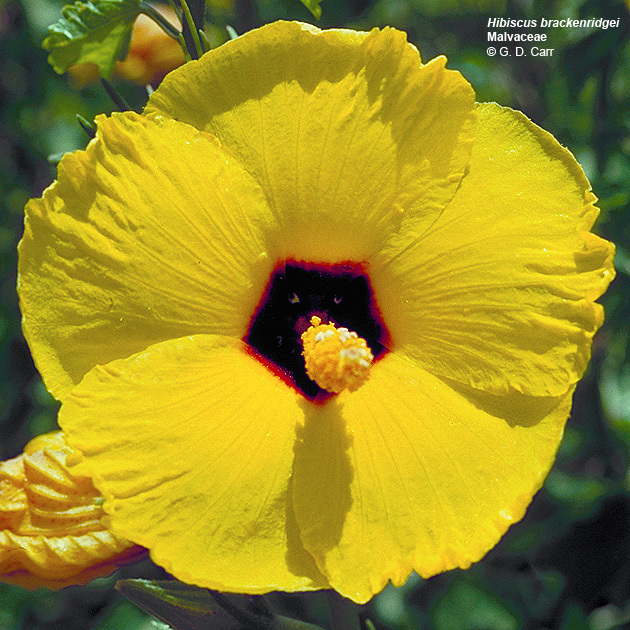 How, why, and when did the yellow hibiscus (Hibiscus brackenridgei) receive this great honor? In 1923 Hawaii was still a territory, and the ilima was adopted as the state's flower following its promotion by an organization called "The Outdoor Circle." In 1950, when statehood was being anticipated by the Hawaiians, a resolution was introduced stating: "Hawaii's official flower shall be the ilima, the flower of old royalty." 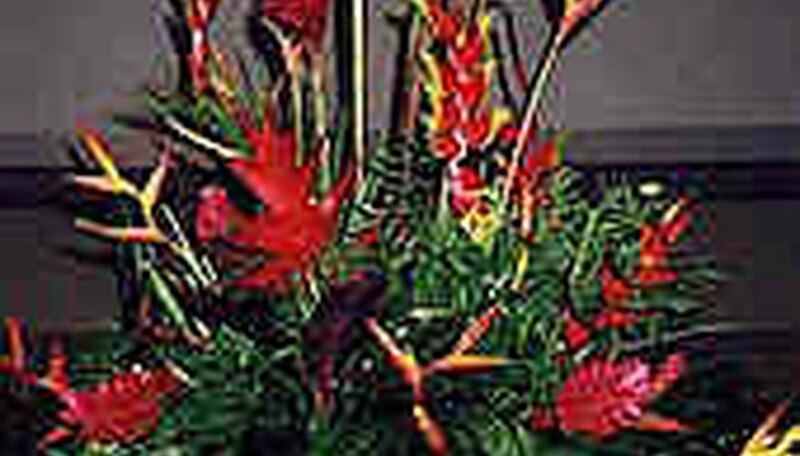 Many Hawaiians felt that the ilima should be the state's flower because the famed ilima leis were always presented to dignitaries who came to Hawaii. Two other exotic flowers, the lehua and the vanda, were also considered. However, when a vote was taken the ilima was chosen as the winner. Hawaii officially became the fiftieth state of America in 1959. The realization that the ilima had never been changed from being Hawaii's territorial flower to her state flower didn't surface until nearly thirty years later! To solve this problem, the legislature decided to legally adopt the flower that had for so long been considered official. Therefore on June 6, 1988, the strikingly delicate pale yellow hibiscus -- Pua Aloalo -- was officially adopted as Hawaii's state flower. Hawaii's state flower (Hibiscus rosa-sinensis) originated in Asia and the Pacific islands. Interestingly, it is also the national flower of Malaysia. This species is a true tropical hibiscus belonging to the Malvaceae, or mallow family. Research suggests there were originally only five species of the tropical hibiscus that were native to Hawaii. Growers began to hybridize these native species with other varieties imported to Hawaii, which produced the huge kaleidoscope of colors and sizes available today. Unfortunately, many Hawaiian Native Plants are endangered species today, including the state's official flower, the Hibiscus brackenridgei. You may be wondering how or why such a lovely flower could become endangered. First, one must remember that many endangered species of flowers have one thing in common. They may be flowers that nobody really wanted in their gardens for one reason or another, and therefore they were never hybridized or cultivated. Or, perhaps they had certain characteristics making them undesirable to gardeners. If you think about it, orchids, gardenias, heliconias, Birds of Paradise, and plumerias are all lovely additions to gardens in tropical areas. This is primarily because these plants have been hybridized and cultivated over the years and they probably don't present any unacceptable concerns to gardeners. One reason the Hibiscus brackenridgei became endangered is that the state of Hawaii passed a law prohibiting private citizens from gathering or cultivating endangered plants. That law has since been amended to allow licensed nurseries to grow and distribute the seeds and seedlings of this beautiful tropical plant. The amended law also says that any endangered plant sold by a licensed nursery must carry a special tag from the Department of Forestry and Wildlife certifying it was obtained legitimately. Fortunately, as more endangered plants are protected, cultivated, and carefully nurtured by gardeners, they will eventually become more abundant. As one horticulturist aptly stated, "It's important to save them [Hibiscus brackenridgei]. Native Hawaiian plants are like living museum pieces." Tropical or Hardy Perennial Hibiscus? To successfully grow hibiscus, you must first learn the difference between a tropical hibiscus and a hardy perennial hibiscus. They are definitely different, and therefore require totally different growing conditions. There are several ways to tell the difference between the tropical and hardy perennial varieties. 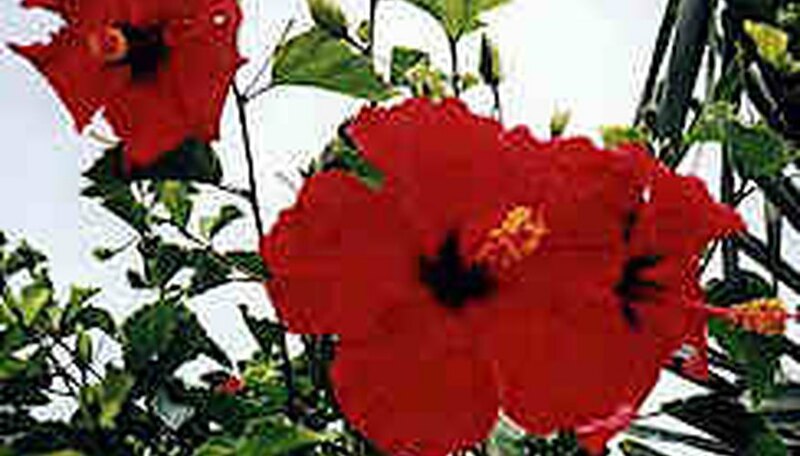 Tropical hibiscuses have dark green glossy leaves, sporting 3-4 inch flowers that are either single or double in colors of yellow, orange, pink, or red. Also, tropical hibiscus can have blossoms of salmon, orange, yellow, or peach with double flowers. Hardy perennial hibiscuses have foliage of medium-green with dull looking leaves that are heart shaped. Their flowers of white, red, or pink are much larger than those of the tropical hibiscus. When in doubt, check with a reliable nursery center before purchasing your hibiscus. Nurseries and garden centers often sell both tropical and hardy perennial hibiscus, and you will want to make sure you know which one you are purchasing. In non-tropical climates, it is recommended that you plant grafted hybrid hibiscus in containers or pots that can be easily moved indoors before night temperatures dip below 40-45 degrees F.
Having the proper soil for your container is critical. A soilless mixture of vermiculite, peat moss, perlite and bark makes a great mixture for hibiscus rather than ordinary potting soil. Pots for hibiscus should be a minimum of 10 inches, and can be as large as 14-15 inches. When your plant is moved indoors, it's best not to over-water it. Since indoor air is often low in humidity, misting the leaves on a daily basis will make your hibiscus happy. Placing your pot on a tray filled with small rocks or gravel, then filling the tray with water is also beneficial. 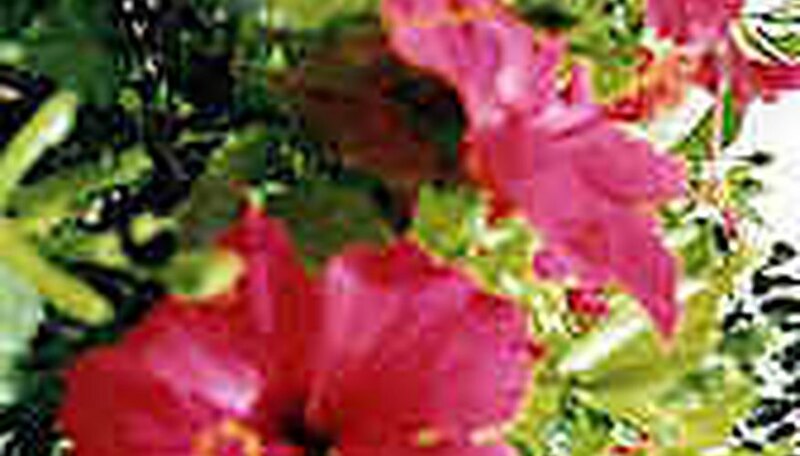 Hibiscus need to be fertilized often, but lightly. A low phosphate fertilizer such as a 7-2-7 usually works well and produces both good quality plants and abundant blossoms. Don't use a lot of high nitrogen fertilizer as this encourages more leaf growth than it does flowers. Inspect your plants regularly for insects such as aphids, thrips, whiteflies, and other noxious pests, whether indoors or outdoors. Should you need to apply any insecticides, water your plants well first. If your plants are outdoors, apply such substances either in early morning or late evening, as temperatures are usually cooler then. If you discover insects on your plants after you've moved them inside, they can be easily treated with Soap-Shield. If you happen to live in a wonderful tropical climate, providing enough direct sunlight for your plants won't be a problem. Otherwise, if you've planted your tropical hibiscus in pots and move them indoors during cold weather, they will need at least four hours of direct sunlight daily. For other resources that will be helpful to you in growing the exquisite hibiscus, you will want to visit the Hibiscus and Other Related Links here on the Internet. Should you ever have opportunity to visit beautiful blue Hawaii, remember to seek out a very special delicate yellow flower -- the Pua Aloalo: Hawaii's Honored Hibiscus! Until then -- Aloha, friends and gardeners!